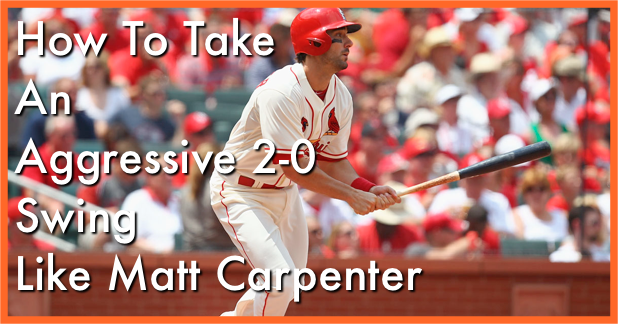 Home / Batting tips / How to improve my baseball swing in a 2-0 count like Matt Carpenter. How to improve my baseball swing in a 2-0 count like Matt Carpenter. If you knew one thing about me it would probably be that I absolutely LOOOOVE old-school swings. Swings like Ernie Banks, Ted Williams, Joe Dimaggio, Mickey Mantle and Willie Mays have always put me in a state of awe ever since I can remember. Those swings are almost instinct now. Guys are bigger and stronger and seem to rely less on their core and foundation and more on their shoulders and back muscles. I’m not saying there is anything inherently wrong with that but it’s always great to see guys like Anothony Rizzo and Matt Carpenter bring back the old-school swag of hitting. In this AoB swing analysis, I will be discussing a few key things about Matt Carpenter that I think you guys can learn from. He’s a “no batting gloves” kind of guy with an Eddie Murray-esque style at the plate, but watch how he attacks the fast-ball like he’s a Killer Whale hunting for seals. It’s a controlled violent swing that get’s the job done. What did you like about this AoB swing analysis video? Did you learn anything useful about the batting tips and Matt’s approach at the plate? Let me know you thoughts as well as who you’d like to see in the next AoB swing analysis episode.